Poppa Bear Custom Cycles is your one-stop shop for motorcycle service in northeastern Maryland and south central Pennsylvania. In addition to our custom trike conversions, we offer several other services to keep your bike in top shape. Oil Changes and Lube Need an oil change or a lube job? Let us do the dirty work. 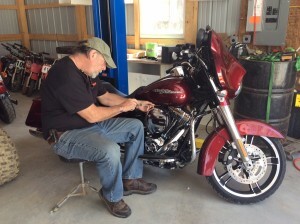 Accessory Installs We install all sorts of motorcycle accessories, including chrome light bars, trailer hitches, trailer wiring harness, fender bras and more. Custom Painting We offer custom motorcycle painting whether it’s a full custom job from the ground up, or just some touch-up painting to cover up that scratch or ding you got on your last ride. Tires Bring your motorcycle tires here, or have them shipped here, and we’ll mount and balance them for you. Contact Poppa Bear Custom Cycles at 410-937-3766 for all of your motorcycle service needs.